Part I: Forensic Toxicology: Illicit Drugs. Opiate agonists (M.J. Bogusz). Introduction. Solid-phase extraction as a separation technique applied for isolation of opiates from biosamples. Papaver somniferum as a source of opiates. Heroin and associated illicit opiate formulations. Morphine; therapeutic drug and heroin metabolite. Other opiate agonists. Concluding summary. Abbreviations. References. Current Methods for the Separation and Analysis of Cocaine Analytes (R.A. Jufer et al.). Introduction. Current methods for the determination of cocaine. Perspectives. List of abbreviations. References. Amphetamines (J.T. Cody). Introduction. Extraction. Derivatization. Gas chromatography. Liquid chromatography. Alternative techniques. Interpretation of analytical results. Conclusion. Abbreviations. References. Hallucinogens (J.T. Cody). Introduction. Lysergic acid diethylamide (LSD). Mescaline. Psilocybin. Phencyclidine (PCP). Conclusion. Abbreviations. References. Cannabinoids Analysis: Analytical Methods for Different Biological Specimens (M.A. ElSohly, M. Salem). Introduction. Analysis of cannabinoids in urine. Analysis of cannabinoids in blood. Analysis of cannabinoids in hair. Analysis of cannabinoids in meconium. Other biological specimens. Autopsy materials. Analysis of cannabinoids in crude cannabis preparations. Concluding remarks. References. Therapeutic Drugs. Sedatives and Hypnotics (T. Kraemer, H.H. Maurer). Introduction. Barbiturates. Benzodiazepines. Zopiclone and zolpidem. Diphenhydramine. Other sedatives and hypnotics. Concluding summary and perspectives. References. Antidepressants and Antipsychotics (D.R.A. Uges, J.M.H. Conemans). Introduction. Analytical techniques. HPLC chromatography. Gas chromatography. Thin-layer chromatography. Micellar electrokinetic capillary chromatography (MECC or MEKC) and capillary electrophoresis (CE). Concluding remarks. List of abbreviations. Unlinked references. References. Non-Opioid Analgesics (T. Kraemer, H.H. Maurer). Introduction. Paracetamol. Acetylsalicylic acid. Non-steroidal anti-inflammatory drugs (NSAIDs). Pyrazole derivatives. Concluding summary and perspectives. References. Other Therapeutic Drugs of Forensic Relevance (Cardiac Glycosides, Antiarrhythmics, Oral Antidiabetics and Muscle Relaxants) (W. E. Lambert, A.P. De Leenheer). Introduction. Cardiac glycosides. Antiarrhythmics. Oral antidiabetics. Muscle relaxants. Concluding summary. References. Other Topics. 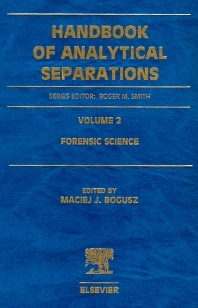 Enantioselective Liquid Chromatographic Analysis of Drugs in Forensic Science (S.H.Y. Wong). Introduction - chiral pharmacology: basic principles and current understandings. Enantiomeric liquid chromatographic analysis. Validation of a chiral HPLC assay. Indirect approaches and column switching. Direct approaches - seven major types of chiral stationary phases: mechanisms of enantiomeric separations and examples. Guidelines for clinical chiral drug analysis. Conclusions. Dedication. Abbreviations. Acknowledgment. References. Environmental Poisons (Mushroom Toxins) (I. Ojanperä). General introduction. Introduction. Amatoxins. Orellanine. Other toxins. References. Environmental Poisons Toxins of Freshwater Cyanobacteria(Blue-Green Algae) (J. Meriluoto). Introduction. Microcystins and nodularins. Cylindrospermopsin. Anatoxin-a. Anatoxin-a(s). Saxitoxins and other PSP toxins. Concluding remarks. References. Pesticides (I. Ojanperä). Introduction. Screening for pesticides. Paraquat and diquat. Rodenticides. References. Analysis of Chemicals Related to the Chemical Weapons Convention by GC (O. Kostiainen). Introduction. Chemical weapons. Sample preparation. Screening methods. Unequivocal identification. Quality control. General concluding remarks. Abbreviations. References. Drugs and Driving (R.A. Wennig, A. Verstraete). Introduction. Legal issues. Surveys that screened for several compounds. Surveys considering only one or two compounds. Case reports. Performance testing. Analytical toxicology. Analytical toxicology of methods specific for one or several drugs. Alternative matrices. Quality assurance. Pharmacology, pharmacokinetics, interpretation. Concluding remarks. References. Unconventional Samples and Alternative Matrices (P. Kintz, N. Samyn). Introduction. Saliva. Sweat. Meconium. Hair. General conclusion. List of abbreviations. References. Aspects of Quality Assurance in Forensic Toxicology (R.E. Aderjan). Introduction. A quality concept for analytical toxicological laboratories. Quality of the outcome. Conclusions. References. Doping Substances in Human and Animal Sport (J. Segura et al.). Introduction. Anabolic androgenic steroids. Stimulants. Diuretics. &bgr;-Adrenergic drugs (rm&bgr;-blockers and &bgr;-agonists). Peptide hormones. Antiinflammatory drugs. Legal aspects. List of abbreviations. References. 'General Unknown' Analysis (R.A. de Zeeuw, J.P. Franke). Introduction. Key steps in STA. 3 Sample work-up. Differentiation and detection. Identification. Conclusions. References. Part II: Forensic Chemistry. Explosives (J. Yinon). Introduction. Extraction and clean-up procedures. Analytical methods. Concluding summary. References. The Chemical Analysis of Fire Debris for Potential Accelerants (W. Bertsch, Q. Ren). The nature of arson. The fire scene. Prospects and limitations of chemical analysis. Laboratory procedures. Current practices of forensic laboratories around the world. Conclusions and future developments. References. Writing Media and Documents (V.N. Aginsky). Paper chromatography and electrophoresis. Thin-layer chromatography. TLC and ink dating. Gas chromatography, gas chromatography-mass spectrometry. GC, GC-MS and ink dating. Pyrolysis gas chromatography. High performance liquid chromatography. Capillary electrophoresis. References. Part III: Forensic Identification of Individuals and Biological Traces. Forensic Identification of Individuals and Biological Traces - Forensic Genetics: From Classical Serological Genetic Markers to DNA Polymorphisms Analyzed by Microarray Technology (A. Carracedo, P. Sánchez-Diz). Introduction. Analysis of minisatellites using multi-locus and single-locus probes. PCR-based DNA systems: analysis of STRs. Standardization efforts and the value of the DNA evidence. References. Forensic Identification of Individuals and Biological Traces - Mitochondrial DNA in Forensic Genetics (M.V. Lareu, A. Salas). Introduction. Forensic applications. Mutation rate. Heteroplasmy. Homopolymeric tracts. Technical approach. Validation of mitochondrial DNA in forensic genetics and the statistical approach. Anthropological applications. References. Forensic Identification of Individuals and Biological Traces - The Human Y-Chromosome; Male-specific Polymorphisms and Forensic Genetics (L. Gusmao et al.). Introduction. Inheritance properties of the Y-chromosome. Forensic application of Y-chromosome-specific markers. Y-chromosome-specific polymorphisms. Population genetics of Y-specific STRs. References.